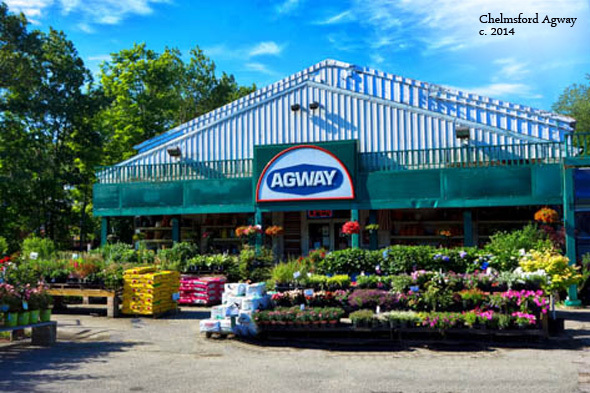 Agway of Chelmsford began servicing its customers in 1964 selling lawn and garden supplies, animal feed and premium pet food. Previous to Agway, the land was occupied by E.E. Paignon Farm Supply and Eastern States Farmers Exchange. Both businesses supported the local community by providing feed to local farmers which were shipped in by railroad cars on the adjacent railroad tracks. The current owners, Lisa and Manny Bougoulas, acquired the business in 2010. They consistently strive to make Agway an exciting and vibrant place to shop. Their focus lies in making sure that the store is well stocked, as well as bringing in new and unique products. Additionally, in their first year of ownership, they began the Chelmsford Winters Farmers Market where they invite farms and small locally owned businesses to sell their locally grown or handcrafted products. Additionally, Lisa and Manny are very active in supporting the Billerica Cat Care Coalition as well as hosting a variety of informative events. Recent seminars included raising chickens, beer, and winemaking, beekeeping, canning and much more. The Store Manager, Glenn Serra, has over 30 years of experience in the business. Glenn consistently facilitates a warm and friendly environment. Please do not hesitate in bringing in your lawn, garden or pet questions. And don’t worry about carrying out those heavy bags of bird seed, pet food or lawn supplies, our staff is always there to assist you.